Ageless warrior Voodoo Lad scored a deserving Group 1 win at his 10th attempt with victory in today’s Winterbottom Stakes at Ascot in Perth. Ridden by hometown hero Damien Oliver, the 7YO Voodoo Lad came from last on the home turn to charge past every runner to score his maiden top-level success. In doing so he became the first Group 1 winner to carry the famous orange and yellow colours of Segenhoe Stud’s Kevin and Lesley Maloney. Bred by Noel Leckie, Voodoo Lad (I Am Invincible x O’fortuna) is a $36,000 Inglis Scone Select Yearling Sale graduate, where he was purchased by Segenhoe off Yarraman Park. He became the seventh individual Group 1 winner for his sire I Am Invincible. It was also the 17th individual Group 1 winner for 2018 offered at an Inglis sale, meaning Inglis graduates have won 68% of Group 1 races in Australia this year where the winner has been sold at public auction in Australia or New Zealand. Peter O’Brien of Segenhoe described Voodoo Lad’s win as “a very special moment for the Maloneys, for myself and for everyone involved with the farm. “He’s a horse who’s close to all of our hearts, because he’s always raced at the top level and never disgraced himself and he so thoroughly deserves his Group 1. 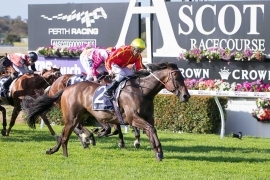 “All kudos to Bill Mitchell, who found this horse for just $36,00 at Inglis Scone in 2013. The Winterbottom win took Voodoo Lad’s career earnings to $1,950,910. Both Yarraman Park and Segenhoe will again be leading vendors at the Inglis Select Yearling Sale Series in 2019. Catalogues are now available for the Classic Yearling Sale and Premier Yearling Sale. To view the Premier catalogue, CLICK HERE. To view the Easter Preview, CLICK HERE.